It was an impressive innings from Pietersen. South Africa aren’t quite ontop of their game, but the atmosphere was fiercely hostile (and England were in a hole at 44/3). He survived it and played a couple of classy shots, confirming not only his ability but his ticker as well. 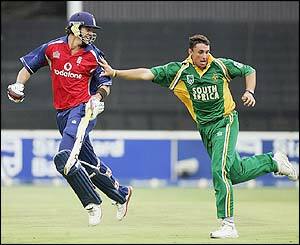 This entry was posted in Cricket and tagged cricket-photos, england, england-in-south-africa, kevin-pietersen, kevin-pietersen-photos, ODI, south-africa, southafrica. Bookmark the permalink.